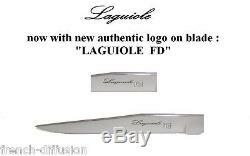 Smooth and very sharp (perfect steak knife). Stainless steel bolster - end - rivets. Handles = real bone, so please wash/dry this cutlery by hand (avoid dishwasher). 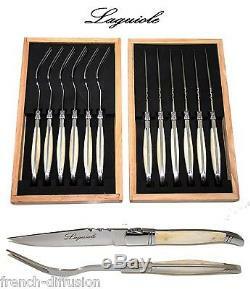 Part of the manufacturing process is still done by hand and the handles are from real bone. (therefore slight differences might occur). 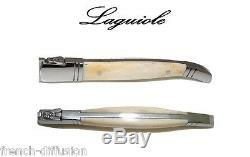 Delivered from France in two wooden LAGUIOLE presentation boxes. 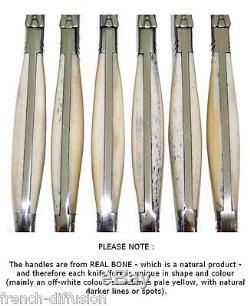 The handles are from REAL BONE - which is a natural product - and therefore each knife is unique in shape and colour (mainly an off-white colour, sometimes pale yellow, with natural darker lines or spots - see picture above). 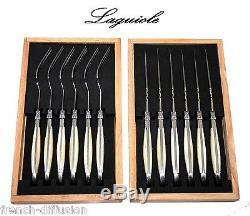 The item "Genuine LAGUIOLE real BONE handles 6 Steak Knives + 6 Forks (12pcs flatware)" is in sale since Saturday, January 07, 2017. 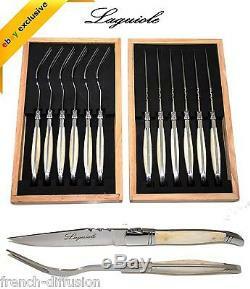 This item is in the category "Home, Furniture & DIY\Cookware, Dining & Bar\Cutlery\Cutlery Sets & Canteens". The seller is "french-diffusion" and is located in Lot et Garonne. This item can be shipped worldwide.